Is this the best multi-day walk in Victoria for newbie hikers? I hadn't done any multi-day hiking since I was at school, and that was over 30 years ago. My (adult) daughter trekked in Nepal a year ago but that hadn't required her to carry her own food and shelter. 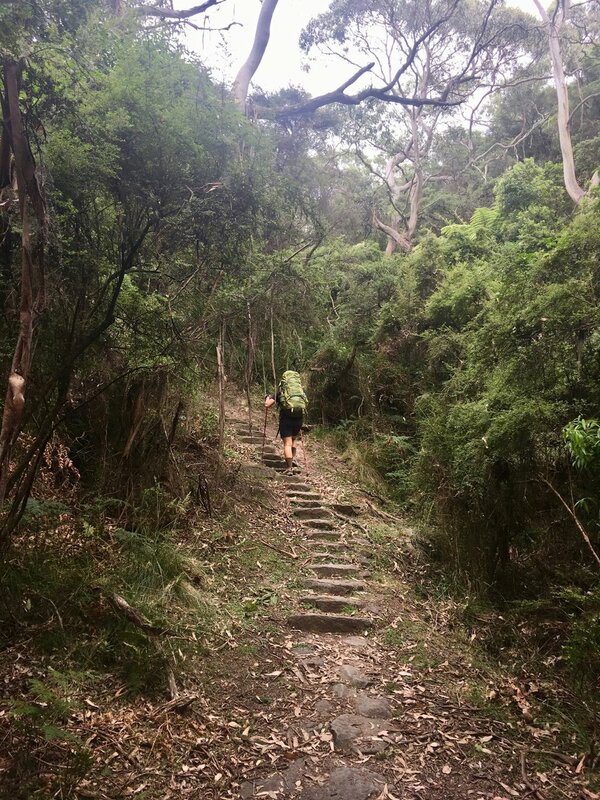 So launching out on a seven-day hike, covering roughly 100km from Apollo Bay to the Twelve Apostles and carrying all our needs for the journey was something of an experiment for both of us. But the Great Ocean Walk turned out to be the perfect way to pound our way back into the joys of backpack hiking. The distances are manageable and the paths are generally well formed. The campgrounds are comfortable without making you feel like you're cheating – and most come with million-dollar views. On the other hand it's certainly not a walk in the park and by each day's end our feet were ready for a break. But the real highlight is the scenery, which is both varied and stunning from one end to the other. Our plans started with a good read of the excellent Great Ocean Walk Official Walker's Map Booklet available from the Apollo Bay information centre and other information centres along the Great Ocean Road. I'd arranged to park our car at the Princetown Recreation Reserve, which I read about in the handy downloadable FAQ document. The reserve is five kilometres from the official end of the walk. From Princetown we caught the 10.45am V-Line bus (which runs Monday, Wednesday and Friday) back to Apollo Bay. After savouring pies, pastries and fresh fruit – our last perishable food for a week – we hauled our packs onto our backs and headed west. This first day is not particularly onerous, though it was a fairly hot afternoon so we felt pretty exposed as we walked between road and beach for the kilometre or so to Marengo. From there it was through the campground and then on the first part of the track proper. Another kilometre, we crested a low point and the coastline ahead of us opened up in a brilliant panorama. This would form a reference point over the coming days as we looked back to see how far we had come. 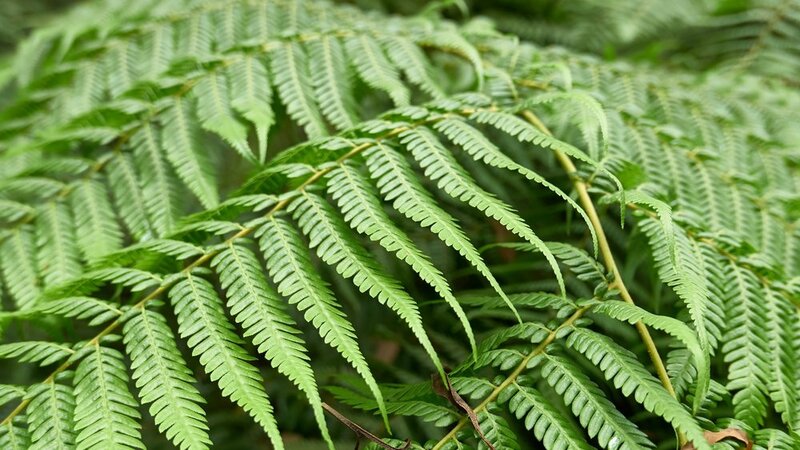 Before long we had entered the Great Otway National Park and found ourselves in some lovely ferny forest, then the mouth of the Elliot River, which could better be named the Elliot Trickle given there was barely enough flow to cool our feet. A steep climb up from the river took us to the first of the GOW hike-in campgrounds, this one among towering gums. Like each of the GOW sites, this one had eight tent sites for independent hike-in campers (these need to be booked online before you leave) plus a separate area for small groups. The sites are well spaced and separated by bush so you never feel too close to your neighbours, if you have any. The camp was about half full on this first night. Each of the GOW camps also has a composting toilet and rainwater tanks. The water is labelled as non-potable and we did use Aquatabs for purification though I have my doubts about whether they are really needed. All the tanks along the walk during our adventure were at least half full, though it was early in summer. Our first night was characterised by the frequent bizarre mating calls of numerous koalas – or at least it seemed like there were a lot of them. We didn't see a single koala ourselves though others in the camp did. Apparently this particular area is paradoxically overpopulated with this endangered species. We woke to drizzle the next morning and were glad of the three-sided shelter, one of which is also at each GOW campground, for a dry place to have our breakfast. The second day of the walk took us inland, into tall timber country. This day was probably the easiest leg of the trip. Most of the climbing was done the night before, getting up to Elliot Ridge. Now it was a gentle climb for five or six kilometres to Parker Spur followed by another few kilometres of gentle descent, then a steeper descent back down to sea level. The walk is mostly on access tracks which made for easy going. It didn't feel like a road though, a layer of fallen leaves disguising the gravel underneath. 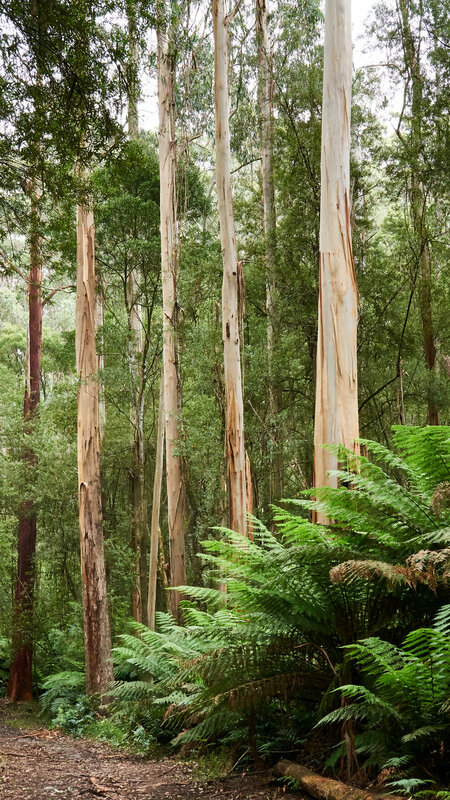 The bush was gorgeous, characterised by towering eucalypts and enormous tree ferns. But the real highlight of the second day was emerging from the forest at Blanket Bay. What a stunning place that is! 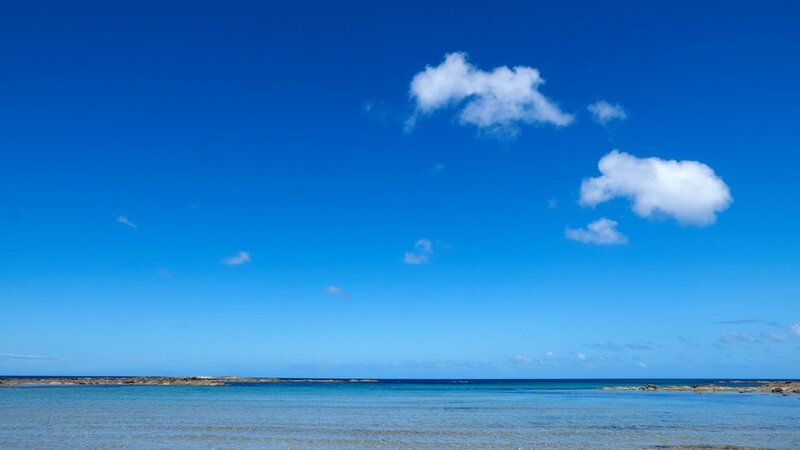 The bay was quite sheltered from the wind when we arrived which only made the blues and aquas of the water all the more vivid against the clear blue sky. A swim was very tempting but the water temperature got the better of me on that front. The GOW campground at Blanket Bay sits next to but separate from a drive-in campground. Tent sites are nestled out of the wind under cover of tea trees beside the creek. It really is a very pretty spot. The third leg of our journey was only about 10 kilometres though for some reason we were quite tired by the time we reached our destination. Perhaps it was a bit warmer, perhaps it was just our bodies come to grips with the new routine. The walk itself was characterised by surprising variety. Again we were mostly inland, with occasional glimpses of the iridescent ocean, but the surround bush changed character quite dramatically a number of times. My lack of botanical knowledge means I can't describe what we walked through, suffice to say it was always interesting. About two-thirds of the way in we reached Parker Inlet, which was flagged in our guide as a potential danger spot at high tide. In our case the tide was nice and low though. From there to Cape Otway the path is closer to the coast though often the ocean is hidden by foliage. I should note at this point that the paths themselves were very well maintained having been recently cleared of overgrowth. We would later learn that this happens about three times each summer. Only on our last day would we find sections of path that were still be cut back. The Cape Otway Lighthouse shop beckoned as a potential source of sugary sustenance. It was that, but only in the form of soft drinks, ice creams and chocolate bars. The full cafe is inside the lighthouse grounds which can only be accessed by paying the entrance fee, which would have made for an expensive coffee. Probably a worthwhile exercise for overseas tourists who are unlikely to be back, but as Victorians we decided to keep civilisation at arm's length on this occasion. We made our way up the hill for about 600 metres to the GOW campsite. This site is probably the least spectacular of those on offer along the walk, but it was still a restful place to spend our afternoon. Where we had had the company of a couple of other groups before this point, it was now down to ourselves and Amy, a English woman doing the walk solo. She was good company but unfortunately we would be leaving her behind the next day as well. We had decided in our early planning to combine two of the standard legs into one day at some point along the walk, and today was that day. With 24 kilometres ahead of us we were up and away early. Based on others we met there are plenty who do the whole walk in four days by pairing up the recommended legs. It's obviously doable, and I know the distances aren't huge for experienced hikers, but to my mind if you're doing this walk as a holiday it would be much more relaxing to take it at the recommended pace rather than walking all day every day. For our inexperienced legs (and feet, more to the point) this was a fairly tough day but still enjoyable. 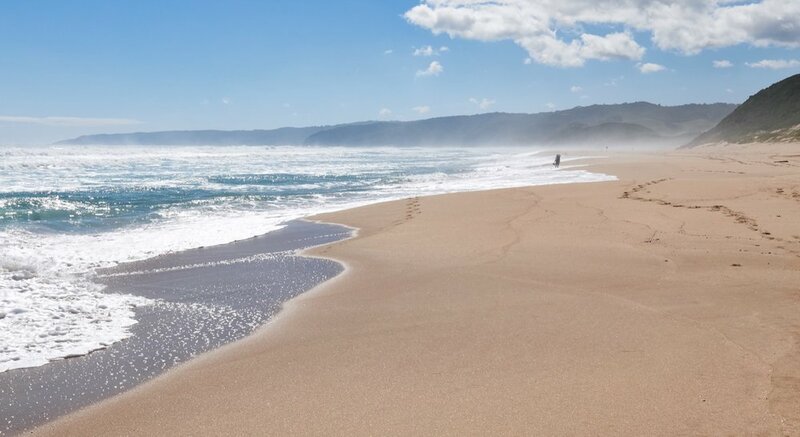 The walk to Aire River is mostly along cliff tops, the foliage clearing at points to reveal great views of Station Beach and ahead to Johanna Beach and even Cape Volney in the far distance, still a couple of days walk away. After a good long morning tea break at Aire River we took the short steep climb back up the cliff for a few miles more of cliff-top walking. We stopped for lunch at the Castle Cove lookout, the only point on the whole length of the walk where the Great Ocean Road meets the trail. It wasn't a particularly nice spot to eat, squeezed into what little shade we could find. However we took pleasure in our smugness as carloads of tourists filed up to the lookout to see a view that isn't a fraction as good as half-a-dozen other views we had had all to ourselves just that morning, let alone on the whole walk so far. There was a bit more inland forest after lunch, including a really nice patch of grass trees, before we descended to Johanna Beach. There's a warning in the guide about potentially high water at Browns Creek, at the eastern end of Johanna Beach, but that was easily crossed without removing our boots. From that point we started the two-kilometre tramp along the beach, fruitlessly trying to find a bit of firm sand to make the going easier. No such luck. We ended up adding the snow cups to the end of our trekking poles to get a bit more assistance. The tide was coming in by this point though it wasn't threatening. By the time we got to the far end the boots were off in a flash so that the cool water of Johanna River could provide our overheated feet with a bit of relief. From the Johanna Beach carpark it's just short of a kilometre up to the Johanna GOW campground, with one of the best camping views you will find anywhere. After the long day before we were looking forward to a shorter walk on this day, which it was, however it ended up being perhaps the most challenging leg of the week. From Johanna we headed up across farmland for probably an hour or so before joining the Hiders Access track. This is a gravel road that climbs about 200 metres vertically to the high point of the Great Ocean Walk at the junction of that track and the Milanesia Track. From there it is mostly downhill, though again on gravel road for a bit of a way. This section is certainly the least picturesque section of the whole walk. One bit of light relief comes from a local 'trail angel' who has a stand set up with free water for hikers (and marmalade for a gold coin donation, which we declined). We met said 'angel' who was interested in our progress and told us of a European girl who he'd met a couple of days earlier trying to do the whole walk in just three days. He ended up giving her a lift for some of the way because there was simply no way she was going to meet her bus in time. The lesson: know your limits! In the last couple of kilometres before Milanesia Beach the track, which is a very rough access track at this point (definitely 4WD only!) goes into a very steep descent which played havoc with the blisters. Once we reached the beach there was an easy crossing of Milanesia Creek then a short beach walk before the path heads inland again. The beach proved a nice spot for lunch. It's only about four kilometres from this point to the Ryans Den camp, but it was probably the hardest single section of the entire walk. There a numerous descents into and ascents out of gullies, some of them on the very steep side. Then, because the going is quite slow, it seems to take forever to travel the relatively small distance. The Ryans Den GOW campground was a very welcome site when we eventually reached it. Thankfully our reward was more sensational views, this time in both directions. 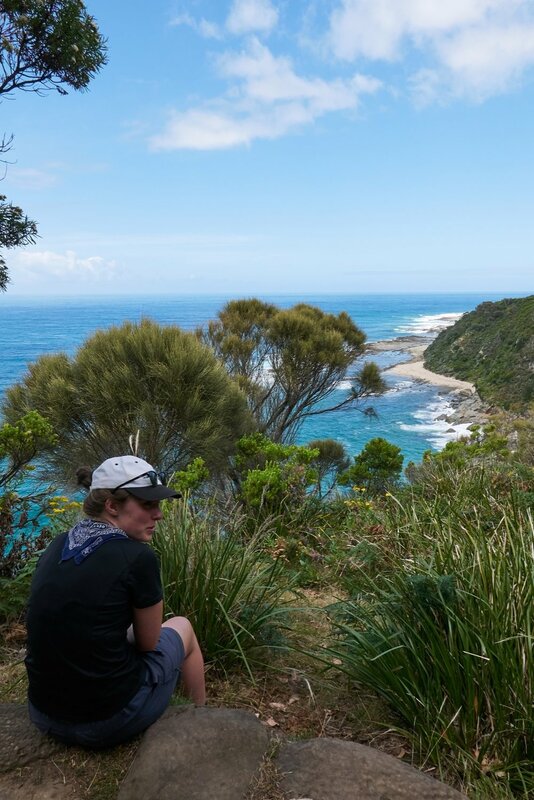 Having left Amy behind a couple of days ago our only other co-camper was another solo female in Yasmine, a young Swiss woman who had started the walk at Cape Otway, and only joined it a few days after first reading about it. The Great Ocean Walk only became a 'thing' in 2006 and I believe that this last couple of sections represents the more recent work (though happy to be corrected). We started day six where we finished day five, with more steep ups and downs through various gullies. We then crossed a short section of farmland heading inland then passed through a nice section of forest with more grass trees and small eucalypts. We broke for lunch at The Gables lookout (nothing much to speak of, to be frank) where we crossed paths with a couple of contractors who were clearing the path. Reaching the top of the Wreck Beach stairs we opted for the inland route rather than descending to the sand. Catching up with Yasmine again later, it turned out she had taken the low road and found it a bit scary in places where there was only a metre or so of shore between the cliff wall and the waves. The rest of the way to Devils Kitchen took us through more gullies though these were nowhere near as steep as what we'd experienced earlier. Once again we were pleased to stop and enjoy more great views from our campground – the view from the loo being one of the best. Although the last section of the Walk is nominally 16 kilometres to the finish at the Twelve Apostles, we had already decided that Princetown would be our end point. We didn't have time or energy to walk the final stretch to the Apostles and then back to the car. The last day was almost entirely along the coast, though mostly behind a wall of bushy trees. For us this section was slow going in parts because it had not been cleared for some time so the bush was closing in. That said, there was never any risk of losing our way. Before we knew it we crested a ridge and spread before us was the Gellibrand River and Point Ronald, with our target, Princetown visible to the far right. Half an hour later and we were back at our dusty car, and after a change of shoes we were soon at the excellent Princetown store chowing down on some 'real' food. All in all this was a fantastic week of walking and camping. 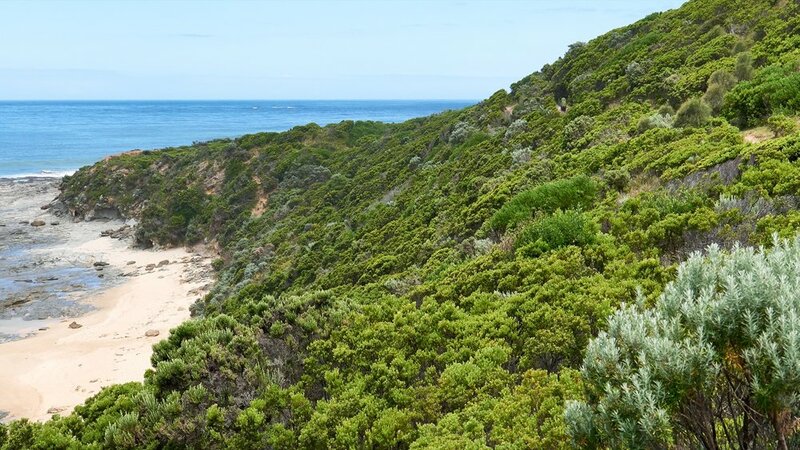 The Great Ocean Walk gives hikers access to a section of this amazing coast that pretty much no one else gets to see. Add camping to the mix and you get to stay and dine on views that would cost a fortune anywhere else. For newbies like us the walk was readily accessible but rewardingly taxing at the same time. It has renewed my love of bushwalking – the pack won't be away for long! If you've enjoyed the photos in this article, you can find more in my Great Ocean Walk album on Flickr. Okay, I cheated to get this one, driving from Princetown to the Twelve Apostles. I'll be back to do the rest later!